Omni Metalcraft Ball Transfer Tables allow Products to be Manually Rotated or Correctly Positioned on Conveyors. Omni Metalcraft Rotation Conveyors are used for workstations that need quick, easy handling of a product, or when more than 2 conveyor lines converge and packages must be transferred from one line to another. Ball transfer positioning conveyors are compatible with 1.9" diameter roller conveyors and feature 1" diameter stud mount ball casters set on a 1-1/2"W x 3-1/2"H x 10 gauge galvanized steel frame. 65 lb. capacity per ball. Legs are sold separately. 1. Determine the ball transfer table size required. 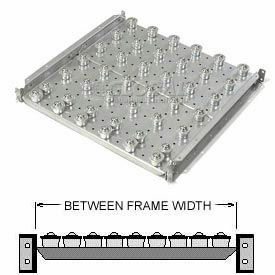 Overall width is determined by adding the Between Frame Width and two 1-1/2" frame sides. 2. Determine the necessary capacity of the table and order accordingly. 3. The closer the centers, the smaller the package size that can be moved. Permanent Conveyor Leg Supports (sold separately) offer height adjustable pivot plate mounts for greater flexibility, and may be bolted to floor. Available in 30" to 42", 18" to 24", 22" to 28" and 38" to 50" Adjustable Height Ranges (click into each Model for all Ranges). 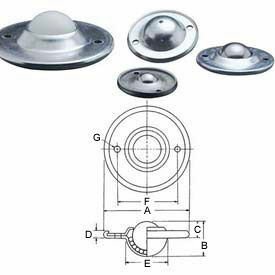 Ball centers are 3", 4", and 6"
Hudson Bearings Flange Mounted Ball Transfers are used for Industrial and Commercial Loading and Movable Retail Store Displays. Hudson Bearings Flange Mounted Ball Transfers are solidly made for long lasting durability and reliability. Capable of supporting up to 250 lbs. and have a 1" ball bearing resting on 80-1/8" individual support bearings. 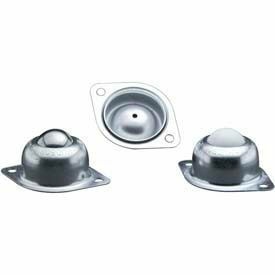 Available with Carbon Steel or Stainless Steel corrosion-resistant balls and housings. Nylon balls are available for non-marking applications. 1" or 1-1/2" ball size. Hudson Bearings Stud Mounted Ball Transfers are used for Industrial and Commercial Loading and Movable Retail Store Displays. 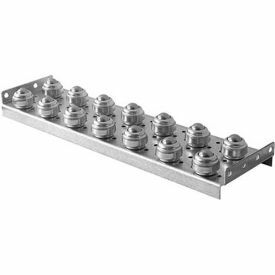 Hudson Bearings Stud Mounted Ball Transfers are constructed with corrosion-resistant plated carbon steel or stainless steel housings for added support and long lasting durability. 1" ball rests on eighty 1/8" individual support balls. Nylon balls available for non-marking applications. Available capacities are 17 lbs, 33 lbs, 35 lbs, 75 lbs, 100 lbs, 125 lbs, 200 lbs, 250 lbs and 750 lbs. Ball constructions are Carbon Steel, Nylon and Stainless Steel. Ball and Stud sizes vary per model. Hudson Bearings Low-Profile Ball Transfers can be Recessed into the surface of a Conveyor System forming a Smooth, Multi-Directional Rolling Surface. Hudson Bearings Low-Profile Ball Transfers feature precision-formed steel housing with integral mounting holes for ease of installation. Available with either Plated Carbon Steel or Stainless Steel balls and housings to provide corrosion resistance. Nylon balls are available for non-marking applications. Hytrol® Ball Transfer Tables allow Multi-Directional Movement of Products along a Conveyor Line in Factories, Shipping Facilities and more. Hytrol® Ball Transfer Tables feature 1" ball casters and a durable steel channel frame to provide long lasting reliability and use. Tables are designed for use where two conveyor lines converge for quick and easy manual rotation or removal of materials and efficient product sorting. Available between-frame widths are 13, 15, 21, 25, 27, 33, 37, and 39 inches. Weight capacities are 240 and 355 lbs. Dimensions vary per model. Ashland Ball Transfer Conveyor Tables are used for Changing Direction of Product at the Intersection of Two Conveyors. 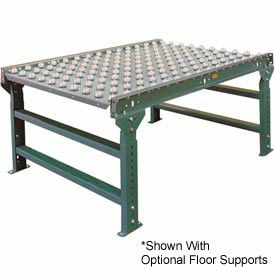 Ashland Ball Transfer Conveyor Tables are designed to match-up with 1.9" diameter roller conveyor frames. Between frame widths are 10, 16, 22 and 36". Ball centers are 3" or 4". Ball capacity is 75 lbs. each. Widths and lengths vary per model. 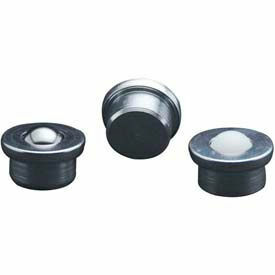 Hudson Bearings Drop-In Style Ball Transfers are for use in Conveyor Systems, Transfer Tables, and Rolling Cargo Decks. Hudson Bearings Drop-In Style Ball Transfers feature an Integral flange at the top that allows the unit to be dropped into a 1-3/4" diameter hole. 1-3/16" Main ball rotates on 1/8" support balls within the support cup. Available with either Plated Carbon Steel or Stainless Steel balls and housings to provide corrosion resistance. Nylon balls are available for non-marking applications. Vestil Ball Transfer Conveyor Strips & Single Support Balls allow for Instantaneous Movement of Flat-Bottom Objects in Any Direction. Vestil Ball Transfer Conveyor Strips are easy to install and simple to use. Simply line up the ball transfer strip on your cart, table or workstation and bolt down with the integral mount tabs located at each end (hardware not included). Ball transfer strips have a durable chrome-plated finish. 1" diameter balls are mounted on 3-¼" centers and offer 75 lb. capacity per ball. Vestil Single Ball Transfer Support Balls can be easily mounted to create your own ball transfer platform. 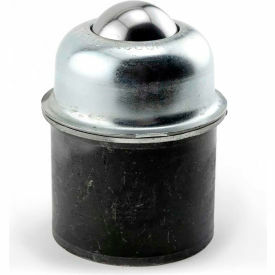 1" diameter support ball is mounted in a hardened cup with a protective debris shield for a lifetime of service. 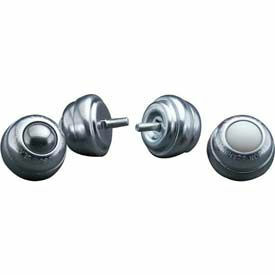 Durable zinc plated finish is corrosion resistant. Each support ball has a 1/8" thick oval-shaped lag down flange with 2-¼" bolt hole centers for simplified mounting (hardware not included). 75 lb. capacity per ball. Ashland Ball Transfer Conveyor Drop-In Insert Plates are used with existing Conveyors for Ball Transfer Applications. 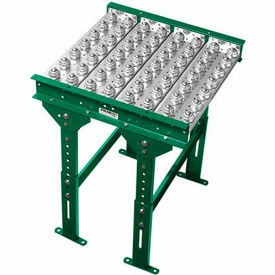 Ashland Ball Transfer Conveyor Drop-In Insert Plates are made of galvanized steel channel to provide long lasting durability. Drop-in insert plate design allows for the removal of rollers and ball assembly insert plates to be "dropped-in" and bolted. Ball capacity is 75 lbs.Ball widths are 10, 16, 22 and 36 ". Ball center is 2 or 3 inches. Vestil Pop-Up Ball Transfer Conveyor Platforms Minimize Lifting and Pushing. Vestil Pop-Up Ball Transfer Conveyor Platforms provide an economical way to change direction for free movement of boxes, dies and parts. 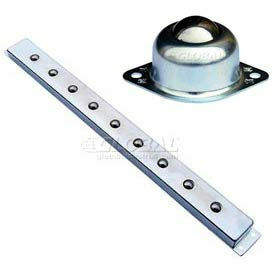 Handle on side of platform retracts balls to provide a stable surface. 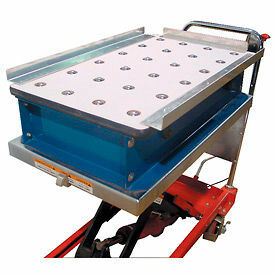 Ball transfer conveyor platform easily attaches to scissor lifts or post lift tables (sold separately). Hudson Bearings Pipe-Mounted Ball Transfers are for use in Conveyor Systems in Front of Shears or Press Breaks. Hudson Bearings Pipe-Mounted Ball Transfers are welded onto a 2" Pipe Pedestal. 1-1/2" Main ball rotates on (90) 3/16" support balls. Protective cover assures low torque and longevity. Available with either Plated Carbon Steel or Stainless Steel balls and housings to provide corrosion resistance. Nylon balls are available for non-marking applications.